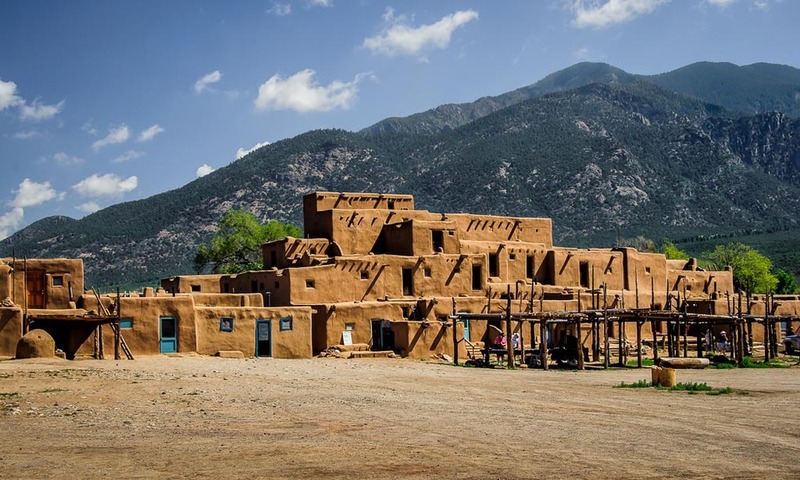 Taos Pueblo is truly a testament to the culture and history of the Pueblo people. The Pueblo is approximately 1,000 years old and is located on a reservation of 95,000 acres. The Pueblo today appears much as it did when the first Spanish explorers arrived in New Mexico in 1540. There are approximately 150 people living at the Pueblo and do so with no running water and electricity. The residents are artisans who produce and sell traditionally handcrafted wares, such as pottery and silver jewelry. They are friendly and willing to tell you about their culture, art and way of life. This image is of the Pueblo's most prominent architectural feature - a multi-storied residential complex built with reddish-brown adobe. The buildings are amazing for their age considering that they are 1,000 years old and are still occupied.